At least he’s a fan of the product. A Disney Cruise Line crew member has been busted for an elaborate embezzlement scheme, in which he’s accused of stealing US$275,000 over two years. The funny part is that he spent a good chunk of that cash taking his family to Disney World. According to an FBI affidavit, Brazilian national Renan Dias Da Rocha Gomes loaded embezzled funds onto Disney gift cards while working as a merchandise host at shipboard stores. He is charged with wire fraud, which could land him 20 years in prison and up to a $250,000 fine. 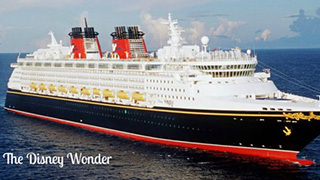 As the offences took place in international waters, Gomes was picked up by the FBI this week when the Disney Wonder returned to San Diego after a Mexico cruise. FBI special agent Joyce Deniz said that Gomes used the ID of another cruise ship employee to gain access to the funds. "Gomes further admitted that he began by embezzling approximately $40 and realized that nothing happened to him. He immediately thereafter began loading the limit amount of $1,000 onto multiple gift cards while working on the ship," the affidavit said. He was detained in custody pending arraignment after being deemed a flight risk.